Writing for the SACP, Jeremy Cronin recently produced a scathing critique of Irvin Jim’s leadership entitled ‘Irvin Gymnastics - the devious art of political contortionism’. In it, he claimed that “the NUMSA leadership clique under Irvin Jim is increasingly ratcheting up its reckless game of brinkmanship, organisational dissidence and electoral boycotting” and that “the capacity of the Jim project to cause damage should not be underestimated”. Here, in full, is NUMSA’s response. By KARL CLOETE. Karl Cloete – Numsa Deputy General Secretary – 22 May 2014. As Communists we must always welcome any debate on the serious crisis facing the workers’ and socialist movement in South Africa today, but we do hope that it will reach a higher theoretical level than that displayed by Cde Jeremy Cronin in his rant, entitled ‘Irvin Gymnastics – the devious art of political contortionism’. Comrade Cronin’s article is remarkable for managing to avoid all the most fundamental questions facing South African workers at the moment – the capitalist crisis of mass unemployment, poverty, inequality and corruption, the wave of strikes and community protests and the role of the ANC government and its allies in all of this. Instead he argues that our biggest problem is a ‘game’ being played by a ‘clique’ led by an individual. From a comrade claiming adherence to Marxism-Leninism, this approach could not be further from the traditional Marxist approach of beginning any assessment of a problem by looking first at the underlying world economic situation, the class balance of forces and the political struggles between capitalists and workers, and only last at the role of individuals. Right from the first paragraph, he identifies the key issue as the emergence of a “NUMSA leadership clique under Jim”, and in almost every paragraph uses the phrase “Jim clique” in order to create the impression that the whole ‘problem’ revolves around one individual, and that the collective views of the NUMSA members, as expressed in its Special National Congress in 2013 and discussions in all 50 Locals and all 9 Regions, are of no relevance. What a communist shame. The reality, which Cronin tries so hard to deny, is that what is happening in NUMSA is a reflection of a profound protest movement amongst its members, other unions’ members and the working class as a whole against the effects of a fundamental crisis of capitalism and a neo-liberal menu so eagerly advanced by the National Liberation Movement. If he were remotely serious, as a ‘Communist’ leader, this explosive mass movement is what he should be looking at. In particular he should be asking why his own party, which always claims to be the ‘revolutionary vanguard’ of the working class, seems to be completely unaware of it, and indeed now finds itself on the opposite side of the barricades to the workers it claims to be leading. A good example of Cronin’s superficiality is his ‘argument’ that the NUMSA “project”, as he calls it, “plays directly into the hands of the most reactionary, anti-worker forces in our society”. This sounds like a serious charge, yet he cannot identify a single one of these ‘forces’ and explain how they are supposed to be benefitting from developments in the union. The owners of all the mainstream media, both print and electronic, who are themselves running businesses for profit and use their outlets to propagate pro-capitalist and anti-socialist propaganda; they include those like the SABC and Guptas who pretend to back the ANC only in order to advance their business interests. The leaders of the SACP, who have become silent in both the ANC and cabinet with respect to the imposition of neo-liberal policies, who have offered no resistance to right-wing policies and are incapable of giving the working class confidence to fight for their interest. The SACP has taken a position that we must take responsibility for the NDR and therefore the pre-occupation to fill strategic positions in cabinet, national assembly, provincial legislature and civil service is considered a necessary co-governance strategy. A few leaders of COSATU-affiliated unions who, with no mandate from their members, engineered, illegally, the suspension of Zwelinzima Vavi, sabotaged the call for a Special National Congress, tried to castrate the federation’s bold policies and turn it into a ‘labour desk’ for the ANC government; several of these leaders have now secured seats in Parliament on the ANC list, which is precisely why they want a weak and divided COSATU. Now into the hands of which of these enemies does Jeremy believe NUMSA is playing? Merely to pose the question points to the answer – they all hate everything NUMSA stands for and will stop at nothing to keep trade unions divided, weak and tame. They fear the emergence of a genuine, radical socialist workers’ movement. To any ‘communist’ this ought to be self-evident, but Cronin’s dilemma is that he is a leader of one of those enemies – Number 6 – and co-conspirator with Number 7. He has to try to avoid explaining why the SACP is not only doing nothing to support workers’ struggles, but actively campaigning to bolster the most right-wing elements in the ANC and government. As our Special Congress Declaration spelled out, “the leadership of the ANC and SACP is protecting the interests of white monopoly capital and imperialism against the interests of the working class. The ANC and SACP leadership defends the ownership and control of the mines, banks and monopoly industries in the hands of white monopoly capital and imperialism”. To avoid answering this serious charge of class collaboration, Jeremy resorts to the old, bogus argument of claiming that NUMSA itself is guilty of exactly the same crime, by working in cahoots with un-named right-wing ‘forces’. The obvious difference is that while NUMSA’s accusation against the SACP is firmly based in reality, his counter-charge is a groundless fantasy. All his other ‘arguments’ are equally pathetic and so easy to demolish. Comrade Jeremy begins by comparing developments in NUMSA with the emergence of COPE and Agang, two of the most reactionary formations, with whom NUMSA has absolutely nothing in common. All such parties will use opportunist rhetoric to win a few votes, but are deeply rooted in the ruling class and its ideology. But NUMSA is not resorting to rhetoric. What Comrade Jeremy calls “its reckless game of brinkmanship, organisational dissidence and electoral boycotting” – is in reality a serious, well-researched political programme for the socialist transformation of society. Far from being “a project … devoid of any sustainable capacity to unify and advance working class power and struggle”, it is a programme that does indeed have the potential “to unify and advance working class power and struggle”, certainly far more so than anything the SACP is offering workers and the working class these days. Comrade Jeremy then proceeds to accuse us of “political contortionism, riddled with contradictions”. NUMSA, he declares wants to transform itself into both a broad general workers’ trade union “AND a tightly-knit, “Marxist-Leninist red union, that uses union resources to act as a pseudo-vanguard party”. NUMSA is well aware of the different roles of a trade union and a vanguard revolutionary party. But we utterly reject the false charge that because a trade union cannot substitute itself for a political party, which is correct, that NUMSA must therefore become a toothless and tame union. This has nothing in common with Comrade Cronin’s view that trade unions are inevitably and permanently conservative, and cannot adopt revolutionary policies, as NUMSA is doing. That is why our Congress resolved “to explore the establishment of a Movement for Socialism as the working class does indeed need a political organisation committed in its policies and actions to the establishment of a socialist South Africa”. This has become necessary precisely because the SACP, far from playing the role of a revolutionary workers’ vanguard party, is now backing, and indeed leading, those Lenin defined as “incorrigible leaders of opportunism” within COSATU who want to turn it into a tame labour desk for the ANC government, and who are using the workers’ movement as a stepping stone to a career in Parliament. Comrade Cronin then turns his attention to the old and bogus charge that NUMSA is guilty of ‘workerism’, recalling the debates of the late 1980s, when NUMSA and others were wrongly accused of ignoring the broader ‘populist’ political struggle for the transformation of society, in favour of a purely workplace-based form of unionism, which Comrade Jeremy defines as ‘syndicalism’. The real issue then, as now, was not a crude choice between whether workers’ organisations need to be involved in political struggles as part of the national liberation movement, or just restricted to workplace battles. NUMSA, and indeed COSATU itself, was always heavily involved in both struggles. It has never been non-political, and is not today, but has always stressed the need to ensure that unions while being involved in politics, also remain independent of any political party and that they are controlled by the workers and not by the party. Comrade Cronin obviously realises he cannot possibly accuse NUMSA of the old form of ‘workerism’, so he claims to have suddenly discovered that “there were always two different ‘workerist’ tendencies in the 1980s, especially within NUMSA itself”. His ‘answer’ also shows that he has made no attempt to even read the declaration or resolutions of NUMSA’s special national congress, which would have proved that NUMSA is in fact squarely in the camp of the anti-capitalist revolutionaries. It also shows perhaps that he is all too aware that those in COSATU who are “firmly rooted in centrist, social democratic corporatist traditions” are the very opportunists that his own SACP is in bed with. “COSATU,” says the Special Congress declaration, “must at all times advance a revolutionary agenda”. This declaration contains none of the “rhetoric” or “posturing” that Comrade Cronin keeps alleging. It is a clear Marxist call for socialism and workers’ democracy, in line with NUMSA’s founding principles. We are proud to plead guilty to Comrade Cronin’s ‘criticism that NUMSA “brands itself as the true upholders of the SACP’s revolutionary legacy, in contrast to the supposed positions of the present-day SACP leadership”. 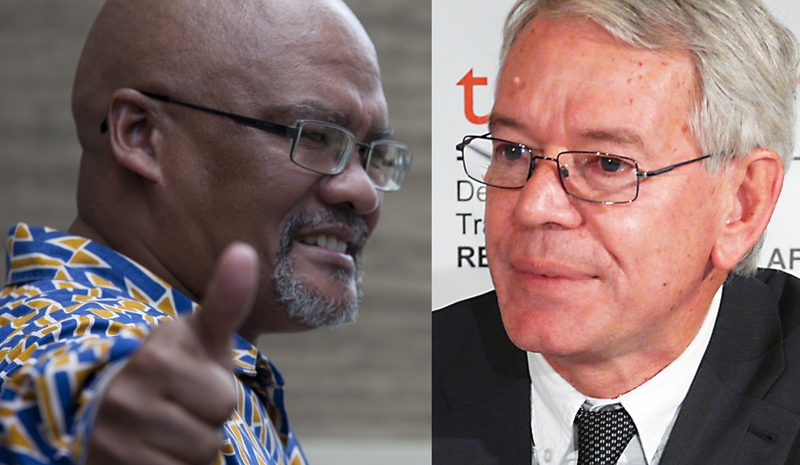 Comrade Jeremy than tries to discover a non-existent division within NUMSA – between a “relatively principled ultra-left within NUMSA, which has always opposed the ANC-SACP alliance” and “a progressive trade union whose prime focus was to recruit and school the maximum number of workers in the metal and related sectors, regardless of the individual workers’ political affiliations”. This contest of different left tendencies within the union, he assures us, “was not a problem (in fact, it was often a strength within NUMSA)” [our emphasis]. But, he warns, “the Jim clique’s attempt to transform NUMSA into a ‘vanguard’ formation will lead (and already is leading) to the fragmentation rather than unity not just of COSATU, but NUMSA itself”. So what he is in effect saying is that provided NUMSA confines itself to polite political debates with “the Trotskyist ultra-left in NUMSA”, that is fine. But once you start to actually implement radical policies, as the Special Congress agreed to do, then disaster and fragmentation is inevitable. Comrade Cronin then turns to what he scandalously calls “the clique’s decision” that “NUMSA should organise along so-called ‘value chains’, rather than within an industrial sector”. That sounds fine, from somebody ensconced in Parliament, but in the real world of work, it has become harder and harder to divide workplaces into neat ‘industries’. To give just two examples: (1) Eskom has built refineries on top of coal mines, so the underground workers are clearly in the mining industry, but those over ground are in the energy industry. (2) Car ferry drivers are involved in transport, but since their cargos are exclusively cars, they are part of the motor industry. The reality is that virtually no union has a clear ring-fenced group of workers. The biggest challenge facing all unions is not how to avoid recruiting workers who are outside their scope, but to reach the thousands who are not members of any union at all. If other unions are not recruiting these workers, then NUMSA’s view it as better for us to recruit them than to leave them unorganised. Comrade Cronin then turns the coalition of nine COSATU unions who voluntarily came together to defend the then suspended General Secretary, Zwelinzima Vavi, and submit a demand for a Special National Congress. He distorts this into “the Jim project cobbling together the leaderships of eight other unions in a factional bloc within COSATU on a ‘save Vavi’ cult of the personality ticket”. So now he is making the preposterous allegation that not only NUMSA’s 350,000 members but the entire membership of no fewer than eight other unions can be manipulated by one man to support his personal “Jim project”. He does not even stop to consider the clear evidence that these workers actually agree with the demands, as demonstrated time and again across the country at workers’ meetings. In the Eastern Cape, this has spread to members of the other ten affiliates and a clear majority of COSATU in the province now support these demands. Further evidence that Comrade Jim has not been master-minding the process, as Comrade Cronin himself admits, is that most of the other eight unions, after discussion amongst their members “do not support Comrade Jim’s anti-ANC, anti-SACP views” – hardly the outcome which a “mastermind” would tolerate! While NUMSA would like to be able to convince them to back all our policies, we absolutely respect other unions’ members’ democratic right to disagree with them, while campaigning together on the issues where there is agreement, particularly the centrality of Cosatu’s Constitution which had been so wilfully violated by the Cosatu National Office Bearers and their clique. An old ANN7 clip hears the 2nd Deputy President of Cosatu saying “the suspension was constitutional” only to hear the South Gauteng High Court declaring that “the suspension of the Cosatu General Secretary was unconstitutional” and hence order his reinstatement. Comrade Jeremy goes on to lament that “Moreover, “they (the other eight unions) are deeply concerned about Jim’s adventurist brinkmanship, fearing rightly that if not checked it will lead to the implosion of COSATU with a ripple effect on every single union.” This is asserted without even a single quote from any members of any of these unions to back this statement up! He has just made it up. Reality is again turned on its head when he accuses “the Jim project” of failing to practise what it preaches on anti-corruption, by “seeking by every trick in the book to prevent Cde Zwelinzima Vavi from having to answer to serious charges within the federation”. Is Comrade Cronin completely unaware that the COSATU General Secretary has consistently demanded the opportunity, as is his right, to answer these “serious charges”? While grudgingly conceding that NUMSA “correctly castigates corruption that is inherent in a capitalist dominated society” he accuses us, yet again with zero evidence to support it, of “secretly flirting with the EFF, led by the most corrupt representatives of tenderpreneuring and capitalist compradorism”. The reality is that both COSATU and NUMSA have taken an uncompromising stand against corruption, have had no dealings whatsoever with the EFF and have called for life-style audits for all leading figures in government, business and unions, including our own leaders and that of the SACP, COSATU and the ANC. So how on earth can Comrade Cronin argue that “We have heard absolutely nothing except deafening silence on this score from the Jim clique”? “The Jim clique,” he drones on, “portrays the current ANC-led state as nothing but the ‘dictatorship of the bourgeoisie’, yet the same clique doesn’t hesitate to take its own federation COSATU to court, placing decisions of internal COSATU organisational procedures in the hands of the (arguably) more conservative wing of this supposed ‘bourgeois dictatorship’ – the judiciary”. Of course NUMSA would prefer to resolve all such matters within internal structures, but surely it has to be free to use the courts when a blatantly illegal decision is taken by one of those structures, as indeed the court ruled the Vavi suspension to be. Comrade Jeremy then reverts to his role of ANC and government spin doctor, when he argues that “[t]he clique tells us that for 20-years the ANC-led government has done ‘nothing for the workers and the poor’, and yet NUMSA is the industrial union that has benefited most from government programmes. NUMSA does not need Comrade Cronin to give us lectures on the progress that we have made in many areas since 1994, which is on record, but will not therefore ignore the many other areas where unemployment, poverty and above all inequality have actually got worse under the watch of ANC governments, notably in the years of GEAR. He concedes that “as the proceedings at the Farlam commission underline, the police, and particularly their command structures, have a great deal to answer for, and not just in regard to Marikana”. But rather than concede that he and NUMSA agree on at least something, he accuses the NUMSA statement on the Marikana death-toll of “deliberately [my emphasis] obscuring the fact that the first 10 of the 44 deaths at Marikana in the tragic week of mid-August 2012 were not at the hands of the police, but included two policemen, two security guards protecting the National Union of Mineworkers’ offices, and six NUM members”. The truth is that NUMSA has never “obscured” that fact, nor the later murders of NUM members, which we totally condemn. But, unlike Comrade Cronin and the NUM leadership, we will never try to use these other deaths to excuse the police’s criminal and reprehensible role in the 34 murders on 16 August 2012. Is this revolutionary Marxist-Leninist disputing the classic view of the state, as an apparatus for enforcing the dictatorship of capital, as expressed by Engels and Lenin? Presumably not – which can only mean that while he agrees with that definition, but believes it is therefore inconsistent for NUMSA to condemn particular “reckless or violent” acts, because they are just the police going about “their inevitable slaughtering work”. It is equally ridiculous to argue that because we accept the Marxist definition of the state, we cannot at the same time call for the “strengthening of the state sector in mining in particular…”, in ways that are beneficial to the workers. It is not NUMSA but Comrade Jeremy who is being totally inconsistent. It always used to be the SACP’s position to “call for the mines to be taken over by a state that operates in the interests of mining capitalists”, whilst still calling for reforms to be implemented by that same state. So why is that wrong now that NUMSA is saying exactly the same thing? To turn his own words against himself: “There is only one word for all of these ideological contortions, this virtuoso display of political gymnastics – that word is: opportunism”.